So, I have this thing about cheese. The thing is, I really love cheese. I like fancy cheese and cheap cheese. I like havarti and New york Sharp cheddar and chipotle pepper jack. I like drunken goat on a good cracker. I like cottage cheese with cheesy crackers. I like grated yellow cheddar by the pound, scattered on a plate full of tortilla chips and melted. I even like cheese whiz on a proper Philly cheesesteak (though that’s the only place it belongs). I like white sauce with cheese melted into it. I like cheese and broccoli soup. I like fresh parmesan on kale salad, and feta cheese on just about any other salad. My childhood best friend recently reminded me that I coined the phrase “drowning my sorrows in cheese.” In high school this mostly meant loading a tortilla with an ungodly amount of cheddar, rolling it up, and calling it a snack. (And I wondered why my skin was oily?) Point is: chocolate had to grow on me. I’ve always been into cheese. My favorite is smoked gouda, if you need a stocking stuffer idea. In sum, I eat a lot of cheese. So, for a while, I’ve been thinking about making cheese. What pushed me over the edge was when I started making my own sourdough bread (I’m still behind a few posts on that adventure). That bread was was pretty tough, not really the stuff I could ever imagine making into a sandwich. (It’s gotten better.) The best I could imagine – to motivate myself to eat it – was to slice up some nice cheese for it. So I started promising myself that soon, I would start making my own cheese. When we were finally doing well enough to be disqualified from WIC, I started getting weekly deliveries of non-pasteurized milk from our local dairy. And most of all, I talked about it. I talked my husband’s ear off about it. I talked about it to my friends. It turns out we are friends with two families who are also highly interested, interested enough to invest, and their interest got me motivated enough to start making things happen. 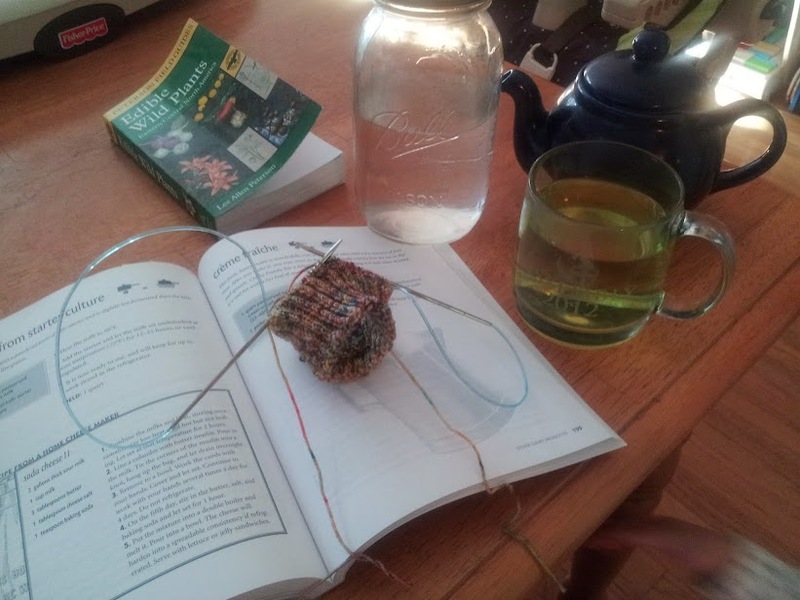 Studying Home Cheese Making, while working on a new sock and drinking goldenrod tea. I felt deliciously relaxed for fifteen minutes. Then naptime ended. I started playing around with easy stuff. I used birthday money to order Home Cheese Making, by that force of nature Ricki Carroll, which is essentially the irreplaceable 101 textbook to making cheese. I read through it on and off all summer to psych myself up. I started making yogurt again, straining some to make sour cream. I make kefir cheese from a starter packet, and 30-minute mozzarella. I wanted to split the batch in half, but looking back, I’m not really sure why I hung it in two bags. Except to look funny. Must be my repressed middle schooler coming out. I made the kefir from a starter packet a friend had given me ages ago, that has somehow survived three moves and lived on in my freezer. 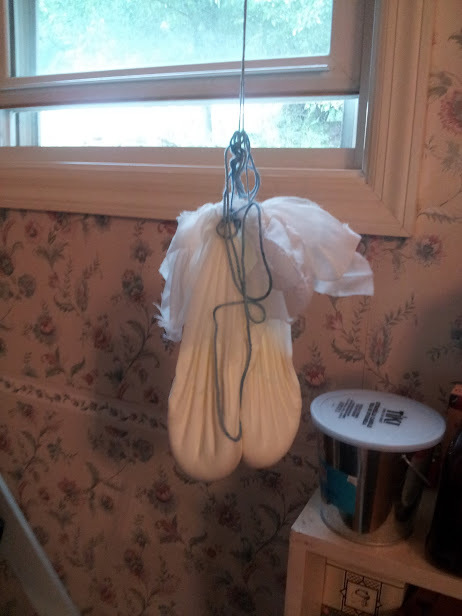 Just made the kefir and hung it in butter muslin until it was about the consistency of curdy cream cheese. It was quite good plain, but really shone with 1/2 t. of kosher salt. Tasted almost like goat cheese. 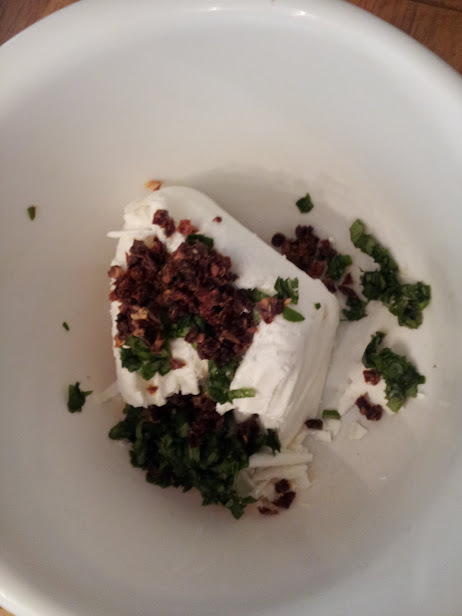 To the other half, I added salt, sundried tomato that my friend left at my house (she lives 4 hours away; I figured she didn’t want it back, though admittedly I didn’t ask), and basil I begged off a very kind neighbor. Ended up with a plant, which was a little more than I bargained for, but hopefully that means I can do this again. The mozzarella didn’t last long enough for pictures. Meanwhile, I was accumulating parts. This and that from the hardware store, this and that from amazon, this and that lying around our house, and this and that from a friend with a bunch of scrap wood and a drill press. This all culminated in our “make party” on Wednesday (I didn’t even know that was a thing, but apparently I organized one!). We now each have a cheese press. They aren’t perfect. The hardware store didn’t have pre-cut all-thread rod that was long enough, so it’s a little shorter than it should be, which means the molds have to be a little shorter than they should be. The molds themselves are confessedly ghetto, but functional. The wood doesn’t need to be food-safe, but I need to McGyver a drip tray so the wood doesn’t become manky from having small amounts of whey soak into it for long periods of time. So you can expect to hear a little more about cheesemaking on this blog. I have accepted that this is no longer just a knitting blog, though exactly what kind of blog it is has not yet made itself completely apparent to me. I just write, and you keep coming back, so we’ll figure it out! Tomorrow… my first hard cheese. My grandfather was a small dairy farmer-he kept Jerseys- but the only cheese he made was cottage cheese. My family always served it just with cracked black pepper on top. Brandon’s family, however, has introduced me to the joys of cottage cheese with apple butter, both of which are entirely unavailable in PNG. Enjoy living in the land of dairy-product bounty! I loved cottage cheese – I would always eat it with cheese its! SO healthy, right? Do you have any kind of dairy animals going on over there? It seems like you should at least be able to get a goat!